How things change. | Damian Trasler's Secret Blog - Do Not Read! This was the first cover I designed myself. And it shows. The book now has a better one. 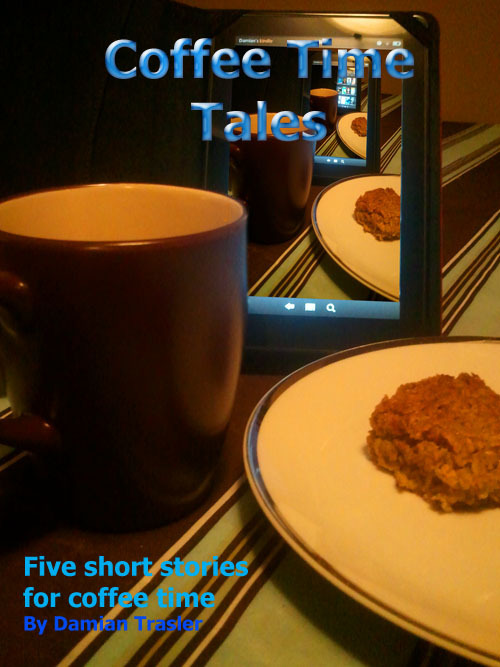 Just over two years ago I published my first e-book, “Coffee Time Tales” (http://amzn.to/16z6R9y ). It was a bit of a joke, a bit of fun, just throwing together some old short stories into a single volume and knocking up a cover pic. There was no marketing plan, just telling people I knew online about it, and doing the obligatory free five day giveaway. Yesterday I found the blog post where I discussed the publishing of the book. A friend asked how it had gone in the comments section, and I replied that I was pleased with the modest 150 downloads. Not so long ago I re-worked “Troubled Souls” (http://amzn.to/17RZzOH), to tie in with the newly-released “Eddie and the Kingdom” ( http://amzn.to/18mSF2w) . I blogged about the re-release, went on Twitter, alerted people to the upcoming giveaway and haunted several publicity blogs, logging in to them to post details of the launch. I actually worked quite hard. Just quite hard, not actually hard. “Troubled Souls” just about topped fifty downloads. Worldwide. You don’t just need a great book, a great plot, proper formatting and an eye-catching and professional cover. You need determination, marketing, planning and the will to be in it for the long haul. This entry was posted in Book reading, Writing and tagged Damian Trasler, ebooks, epublishing, marketing plan, selling ebooks, writing. Bookmark the permalink.